George Lennard was born in Newark, Licking County, Ohio on 5 May 1825. He attended the Eletic Medical Institute of Medicine at Cincinnati, Ohio. After graduation he came to New Castle, Indiana in 1851 to practice medicine. He gave up that practice a couple years later to purchase the New Castle Courier. On 10 Jan 1852, at the home of George Hazzard, he was married to Clarinda Woodward. To them were born two sons, Henry Rudical Lennard, Asahel Woodward Lennard, and one daughter, Gertrude Lennard. At the outbreak of the War of Rebellion, he was one of the first to volunteer. 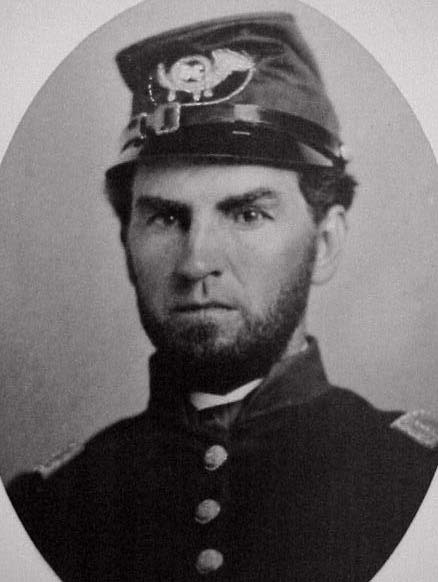 He joined Company C of the 36th Indiana Infantry Regiment and was promoted to 1st Lieutenant. He was later promoted to full Colonel by Indiana Governor Morton, and assigned to the 57th Regiment, Adjutant Corp. He was in the battles of Stone River, Missionary Ridge, Rocky Face Ridge and Reseca. At the battle at Reseca, on 14 May 1864, Col. Lennard was wounded by artillery fire that shattered his right knee that caused him to go into shock from which he never recovered. His last orders before he was taken from the battlefield were; "Now take good care of the boys Major." Clarinda Woodward Lennard died on 1 Jun 1879. They are both buried side-by-side in the Southmound cemetery in New Castle, IN. On 1 Apr 1883, the Grand Army of the Republic Post #148 was named in honor of Colonel George Washington Lennard at the city of New Castle, IN.